Surasak Suwannachote, 26, center left, and Surin Tabthong, 37, center right, who killed an Australian woman sit on a motorcycle during a police re-enactment in Phuket, southern Thailand in June. Pic: AP. Thailand has the highest gun murder rate in Asia, according to www.gunpolicy.org, a site hosted by the University of Sydney’s School of Public Health in Australia. Source: UNODC – have only included 2002-2011 figures (they start from 1995 in the source) and made changes to the appearance of the data so it fits in the width of a webpage. Have excluded “Western Asia” as the Middle East would be a more apt description for most countries. 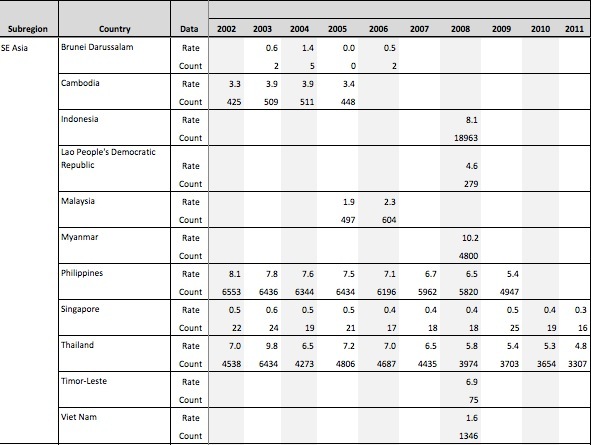 BP: Thailand has a high homicide rate compared to many other countries in Asia (although you will see only limited data for most countries is available), but the number of homicides and the rate have actually dropped since 2006. 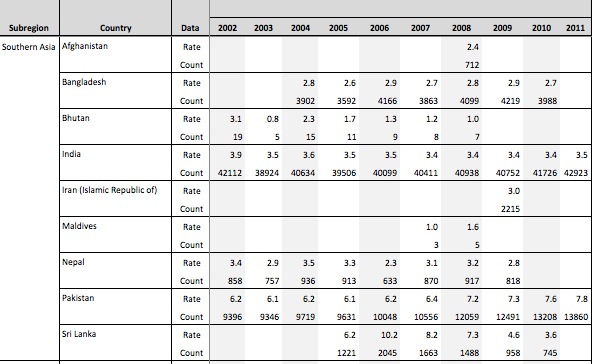 Actually, the 4.8 homicide rate per 100,000 matches the latest homicide rate in the US (from 2010) listed by the UNODC. The gunpolicy.org is currently down so hard to verify their data, but BP has not seen any data that suggests that gun violence in Thailand is on the rise. If anything, it is becoming less of a problem despite more news on TV about it….